Anything special about MDCX ? In Sicily, dates are often represented in a slightly unorthodox manner. 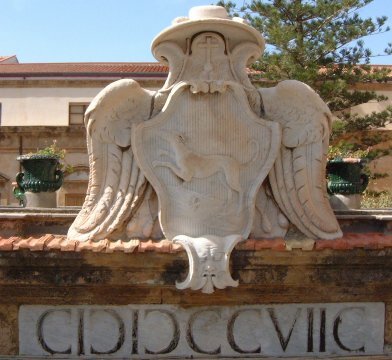 This crest, with its date, is above the gate to the Bishop's Palace in Cefalu. Can you work out the date? The characters in brackets are unicode; they display correctly on my computer. For a table of unicode Roman numerals, see here. The tower of Winchester Cathedral fell down in 1107, and was rebuilt. Each letter that corresponds to a Roman numeral is in red and in a larger size (you can just about see that in the photo). If all such numerals are added together, the result is the year in which the fan vault was added. Can you work out this date? SINT might be better moved to the end of the sentence; it's not possible to see any clear start or end point in the photo. The text from Isaiah 49 v.23 is simply "Et erunt reges nutritii tui, et reginae nutrices tuae". These two legends appear on the facade of Saint Carolus Borromeus Church in Antwerp. Just as in the Winchester example above, the large letters, comprising all those that are also Roman numerals, may be added up to get important dates. The first, on the left, gives the year in which the church became a self-standing parish through the concordat with Napoleon. 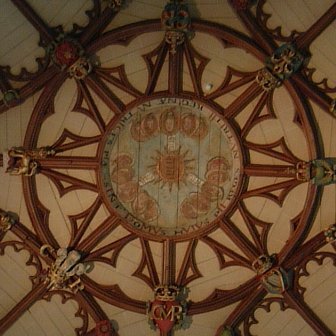 In the second, on the right, the Latin suggests that it was a year in which some restoration work was completed. It should not be difficult to work out these dates.